Wednesday April 27- 1932. I did some washing in AM. Rested after dinner Later Mary came and took me up to Dr Neds office did not find him in. I lay on the couch after supper and went to bed early. I felt so tired. Thursday April 28- 1932. I slept all night so feel better. Did the ironing Letter from Emma Herriott. Ott here for dinner Hattie here part of afternoon. I read all evening. Friday April 29- 1932. It was a cloudy day. I read some in forenoon and was down stairs awhile I slept most of the PM Read after supper and wrote Mattie Stitt & Mrs Doyle. Saturday April 30- 1932. Did morning work. Hattie down before noon. After dinner we rode to Oxford with Rob. Letters from Will Work & Sister Ida Wrote to her and Winnie Sunday May 1st 1932 Went to SS & Church with Ott. Our class finished the flowers (pink roses) I rested after dinner. Tishie H- came for a long call. 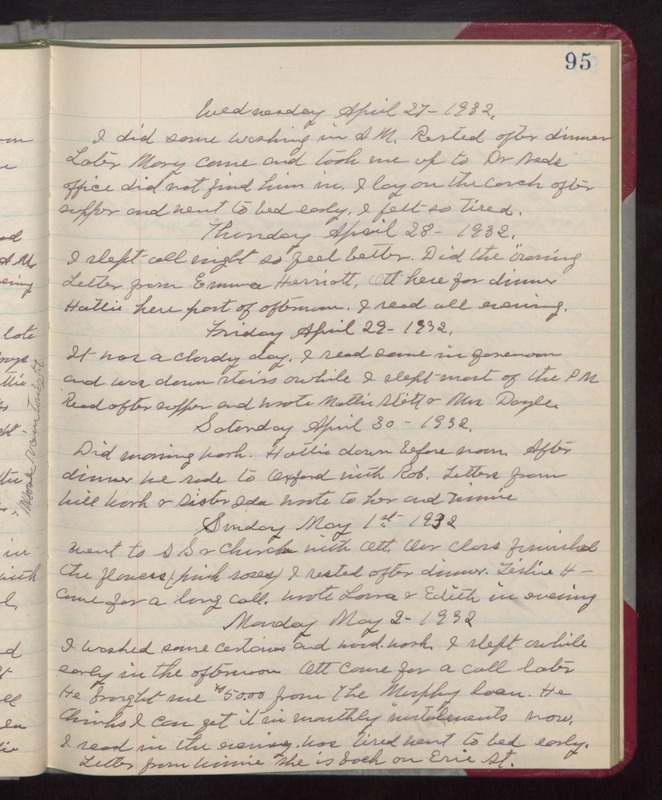 Wrote Laura & Edith in evening Monday May 2- 1932 I washed some curtains and wood-work. I slept awhile early in the afternoon Ott came for a call later He brought me $50.00 from The Murphy loan. He thinks I can get it in monthly instalments now. I read in the evening. Was tired went to bed early. Letter from Winnie She is back on Erie St.